The FPOL Committee of the City of Fremantle will on Wednesday decide if it will allow two more parklets in Pakenham Street. The one in front of the Natural Light cafe has been removed and the shop is now on Marine Terrace, but the operators of a new gin distillery, bar and restaurant want to put a new parklet there. The owner of the Ghetto Blaster hole in the wall cafe also wants a parklet in front of his business, so if approved that would make it five parklets in Pakenham Street. The long-awaited community parklet at Wray Avenue, designed by Jean-Paul Horre is quite beautiful and will no doubt attract local people. JPH raised $ 14,000 through crowd-funding and the City of Fremantle matched that dollar for dollar under the One Planet policy. The big challenge is for the parklet not to become a de-facto alfresco addition for Lenny the Fox cafe, and the designer is aware of that and signs will point that out. It looks great so well done and even has disabled access, which is very thoughtful! A report in the West Australian yesterday that the sales of electric cars in Australia has dropped by 90 per cent made me wonder what is happening with the Fremantle solar charging station as part of the RAC electric highway. Sales of electric vehicles in Australia have always been very low so the One Planet $ 50,000 investment by the City of Fremantle appears to be money not well spent, as only a handful of drivers would use the charger. The charging station at the Esplanade was supposed to start early last year but I have since been told by staff that the City is looking for another location for it. Another One Planet project, the solar parklet near the Lenny the Ox cafe at Wray Avenue, is also very slow. The last I heard from the project manager was that it would start in December last year but that has not eventuated. 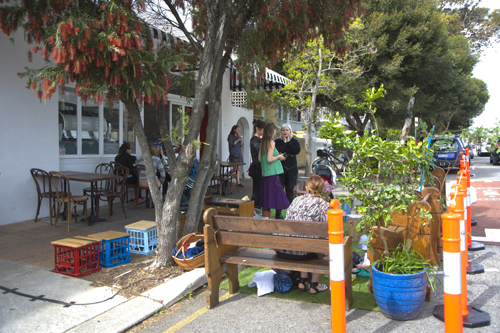 The City of Fremantle should have another look at its parklet policy and adjust it as it is not working at present. The parklets that have been approved are more often than not vacant and not used by anyone for days, so they are a waste of space. I walk the streets of the West End every day of the week and have never seen anyone sitting at the parklet of the Fremantle Hostel in Pakenham Street or the one down the road at the Natural Light photography cafe. Even the parklet at Bread in Common in the same street is mostly without patrons, and the one at the Lapa restaurant in Hight Street, next to the more frequented alfresco area of the National Hotel, is also hardly ever occupied with diners. In contrast the very first Freo parklet at the Moore&Moore cafe in Henry Street is popular with patrons. Parklets take away essential inner city parking and loading bays and if they are not used they should be dismantled and the space returned to the City for parking as these empty spaces are not attractive at all. The mobile parklet that started at Kings Square for the Fremantle Festival 2015 is now parked at Studio 37 cafe in front of PS Art Space in Pakenham Street. I like it that this parklet is elevated and wonder if the City of Fremantle would encourage future raised alfresco parklets at cafes. It is making a street feature out of something that is generally quite bland. It appears I have to get better at writing in the English language because I don’t seem to be communicating what I mean. The floodgates opened yesterday with people commenting on my article about the proposed parklet in Wray Avenue. It was a negative rant and against the parklet, etc. but that is simply not true! Contrary to some of the people who commented about parklets in general and don’t like them or that they take car parking bays away, I do support some parklets in appropriate locations around Fremantle. This is the last paragraph of yesterday’s blog post “To make it very, very clear!! I support the parklet at Wray Avenue. I think it will look good and it will help to slow down the traffic a bit, but the cafe is a commercial enterprise like all other hospitality outlets in Fremantle and it should not get preferential treatment from the City of Fremantle. I wish them well with the crowd funding! For the record. The proposed parklet would take away only two motorcycle parking spots but not a car bay. I hope because it is located near the new pedestrian crossover it might help slow down traffic and that is pretty important as I watched a Transperth bus almost ceaning up a lady who was crossing there. It might well be because the crossing does not look like an official zebra crossing so motorists don’t see the need to stop and give way. Maybe a couple of signs might help to make it safer, City of Fremantle? So let me reiterate my sentiments about the funding of the parklet that is supposed to become a community hub. In my opinion it will become a de facto, pseudo extension of the alfresco area of Lenny the Ox cafe. It is a popular cafe and it does not have a lot of outdoor seating, so why would patrons not use the ‘community hub’ to have breakfast and coffee? It makes sense that they would and that is the whole point of my argument. For the City to fund it with $ 14,000 creates unfair competition because other hospitality outlets have been paying all the cost to create a parklet outside their cafe or restaurant. To say the intent is to make it a public space is lovely but pretty naive, because the reality will be that cafe patrons will be the main users of it, hence it should not be partly funded by the City of Fremantle, no matter what process was followed. ROEL FOR FREO!. Beaconsfield Ward. Truly Independent.